It leads from the M62 at junction 26 in towards the city centre. On the face of it, not all that much. Well, it's a very sensible idea, to link Bradford's Ring Road to the M62, with a junction in the middle for luck. But, the junction in the middle is solely for a trading estate. No towns or districts are mentioned, just this trading estate. And then you can't get from the trading estate into Bradford via the motorway - you have to use a narrow road that runs parallel. Err, no. 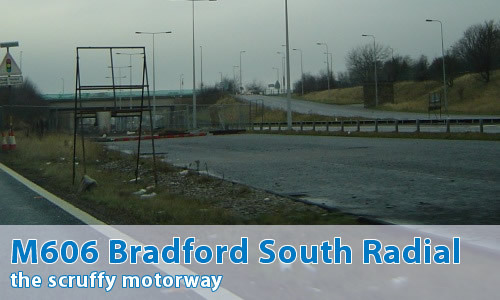 The official title of the M606 is apparently the "Bradford South Radial Motorway". Catchy, isn't it! Anyway, when the motorway was laid out, it was to go through the city centre, and become the "Bradford North Radial Motorway"... (I think I see a pattern appearing here!). The northern section was scrapped, and so we are left with a literally half-built motorway junction. One where half of the motorway goes under the junction and starts at a mini-roundabout, and the other carriageway...doesn't. It's really indescribably awful. Just to give you a start, though, the photo above is taken at the mini-roundabout, where it shows the state of the northbound JCB-only carriageway. An honourable mention also goes to the junction with the M62. There's its own set of sliproads if you're coming from (or going to) the Manchester direction, but if you're going to (or coming from) the Leeds direction, you have to use a roundabout. If you're going to do a job, do it right, not some half-baked nonsense, eh? Ah, but there's a post script to this tale of woe, isn't there? Indeed so. Since this page was originally written, the junction at the northern end of the M606 has been tidied up nicely, so that's one less thing to complain about. So, have you got a map showing where the M606 should have ended up? Yes, thanks to Jim Rayner - there's one here. The southern end of the M606 now has a 2+ vehicle lane leading onto the M62 eastbound. This lane starts not long before the normal turn off for the M62 east and carries on just separated by white lines down to the roundabout where the lane skips the traffic lights, then gos along the M62 for about a mile.